I adopted Isla (German Shepherd mix) from a shelter about a month ago. She’s approximately 9 months old now and she’s very sweet…95% of the time. However, despite some prior exposure in her young life, to walking on a leash, we can be out for a walk or on a potty trip and for no apparent reason she will go all Cujo on me. Writhing, bucking, and biting…anything that might work to free her from the restrictive nature of the leash. There are no other dogs present, no people, no stimuli to warrant Cujo showing up. She’s just royally ticked off that she’s on that leash and by golly, she wants to be free of it. The best I can do at this point is to get a death grip on her collar, which affords me some protection from those pearly white, sharp teeth, and calmly talk her down off the ledge. Sometimes that works on the first go, sometimes not. Even if I have treats on me, for other pursuits (sit, down, stay), I feel like giving her a treat, once she’s calm from the meltdown, will give her the wrong idea. I even bought a muzzle, but I’m 64 years old and getting that sucker on her is simply NOT happening. I am in the process of de-weeding a fenced area in my back yard and giving her the supervised opportunity to burn off some pent up energy, but that may make it worse when she is leashed. Any suggestions, short of getting one of those padded suits (which won’t bode well in a Texas summer) and toughing it out? Sounds like you’re both getting quite the workout! It also sounds like there are a few challenges that definitely need to be addressed. We’d be happy to provide a few dog training tips. Triggers – although you mention there’s no apparent reason, if the “Cujo behavior” keeps happening, there is likely a trigger somewhere. Even if it’s an internal trigger such as, “We’ve been out here for X amount of time and now I’m bored and frustrated.” Consider the time-factor. Is it immediate? After she has gone potty? Is it the overall pace of the walk? Would she rather run than stroll? Function of the behavior – Keep in mind that all behaviors have a function – to either get something or avoid something. Does Isla enjoy the Cujo game with you? If she does, and you don’t, then switch up the game. Reinforce the behaviors you like and want, before she goes into her whirling dervish mode. Walking nicely on leash is what you want, yes? Teach her that skill and reward her with treats, petting, praise, and anything else you can give her while out in public. (A game of tug or fetch perhaps?) If you teach and practice those skills first, then she’ll know what the right choice is. Treats – what types of treats are you using? For a situation as challenging as leash walking, you might need to up the game. Higher value such as little bits of boiled chicken or steak might be more motivating for her. Isla will let you know what she prefers. And, make sure she’s hungry. (Not starving.) If you’re feeding her a big breakfast, then going on a walk, she’s less likely to want food. So, use her meals to your advantage while training her. Shape her behavior – because of her age, and this particular challenge, you might want to start out with shorter but more frequent training sessions. Instead of 30 minutes, go for 2-3 10-15 minute sessions. This is especially true if she starts going Cujo at a certain point. For instance, if she’s fine up until the 12-minute mark, then go for 10 minutes. Give her a break then go again. This might be a bit more inconvenient for you, initially, but once she’s trained you’ll be able to venture out for longer periods. It’s also good to practice in lower distracting environments – around your home and yard, before heading out to the streets. Remember to reward behaviors you like and want, teach Isla what you want, and set her up for success so she learns what the right behavior is and can make better choices. 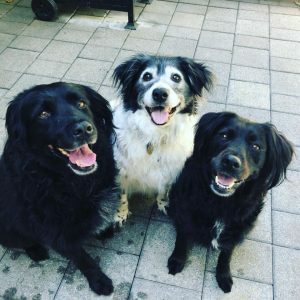 If you’ve been considering bringing a second (or third…or fourth…) dog into your home, you might be asking yourself questions such as “Should I” “Should I not?” As with most new endeavors, it should begin with a plan – of some sort. In the beginning stages of contemplation, your initial plan might begin with a general pros and cons list. So for this specific blog post, we decided to collaborate with fellow animal advocate Allie Cooper of PetPaw&Tail18. She has graciously provided some helpful info to help you start your journey into answering questions you may have. There are numerous benefits of having a multi-canine household. But this of course also comes with additional responsibilities. The following is a little pros and cons list we’ve developed for dog owners, to help answer the “should” questions, along with any others they may have come up with. PetMD explains that dogs may go into fight or flight mode when faced with strange people, animals, and environment, resulting in experiencing increased stress. Dogs who are not used to being walked in public, seeing new faces and smelling other inquisitive canines might appear shy or even display signs of aggression. 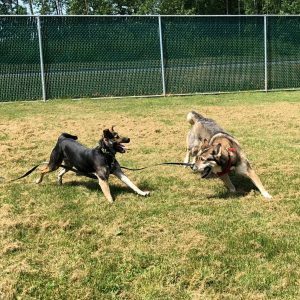 It’s very important that puppies get accustomed to these situations early on through force-free puppy classes, where he or she can be introduced to other dogs, people, and situations. Professional dog trainer and author of Plays Well With Others Pat Miller claims that playtime with other well-trained dogs can teach them social skills. This may result from reading and mimicking appropriate body language and displayed behaviors. Although, it’s vital to ensure that the introduction is gradual and that the older dog they are learning from is well-behaved and non-aggressive. This can help your new puppy become more comfortable, less fearful, and grow into a healthy and happy pooch. As for older pets, the senior pet wellness article posted by Maryville University adds that they may benefit from getting socialization and companionship, depending on their personality. However, getting older dogs accustomed to other dogs and unfamiliar environments might take more time and patience as they may have already become set in their ways. Dogs have long been considered man’s best friend and have proven their place as great companions. Having more pets can enhance the physical, emotional and social benefits of pet ownership such as feelings of love and delight. It may also provide more opportunities to create bonds with other pet owners and animal lovers. Owners will be encouraged to get more exercise when walking or playing with their pets. 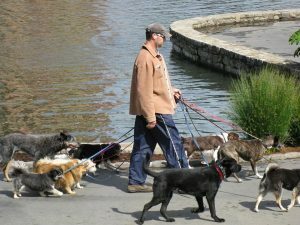 The study published by BMC Public Health revealed that dog owners added an average of 22 minutes to their daily walk compared to those who did not have dogs. They walked at an average pace of 3 miles per hour which falls under CDC’s prescription for moderate intensity exercise. Considering that lack of movement is linked to obesity, having more than one dog can help owners become more active and health conscious. Furthermore, if different dogs require different exercise durations and methods, owners can provide each dog with what he or she needs while getting twice (or more) exercise sessions themselves. Of course, having more than one pet also means having more than one mouth to feed, more than one cuddly body to groom, and more companions to bring to the vet. Time Magazine’s report shows that small to big dogs typically cost $1,001 to $1,448 annually. The breakdown does not include fees like spay and neuter services or other types of resources that dogs with special conditions might require. Dogs will be dogs. And, when humans neglect them, they will often entertain themselves. Sometimes their choices can be good, like playing with enrichment toys or their siblings. Other times, he or she might decide to partake in behaviors we humans would deem destructive. It is the owner’s responsibility to watch after them, train them, and keep them happy and entertained. If you have time to go out for walks only once a day, you’ll want to make sure the entire group can go together successfully. If you need to take the dogs’ separately, then you’ll need to adjust your schedule. Will each walk be shorter so you can meet your time commitment? Or, will you need to recruit help? In addition to our recommendations for hiring a dog walker, make sure this professional can handle caring for multiple dogs at once. 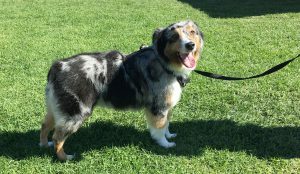 Pawfect Mutt Match or Canine Conflict? Change can be good, but it can also be challenging. If your resident dog is used to flying solo, he or she may look at you in disbelief when meeting their new sibling. On the flipside, he or she might be head-over-paws in love! 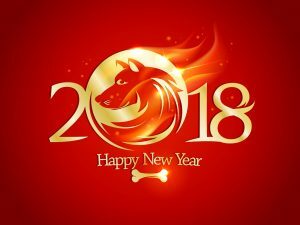 Take into account there will be an adjustment period – for everyone, dogs and humans – and that the timeframe will be different for each one. Training and management can help you all get through the process. 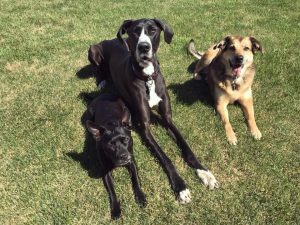 If your current dog has behavioral any challenges that need to be addressed, we recommend you do so before bringing another animal into the family circle. (Keep in mind that things can change again once the family dynamic changes). Responsible pet ownership means that you also have to think about how your pets might react to having a new pet in the house. Take some time to weigh these pros and cons before signing the adoption papers, while making sure that everyone — man and animal — is on board for the new pet. 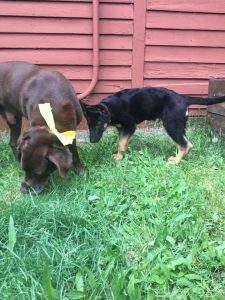 PetPaw&Tail18 runs her own shelter in Ohio with her life partner. She is the proud owner of two beautiful Labradors, Molly and Kiki—Molly being the first rescue of the shelter. She dedicates her life to saving and finding mutts a loving home and cannot imagine not having a dog of her own. K9 Nose Work: One Sport Your Dog May Want to Sniff Out! In K9 Nose Work, dogs learn how to search for a specific odor or odors and find the source. 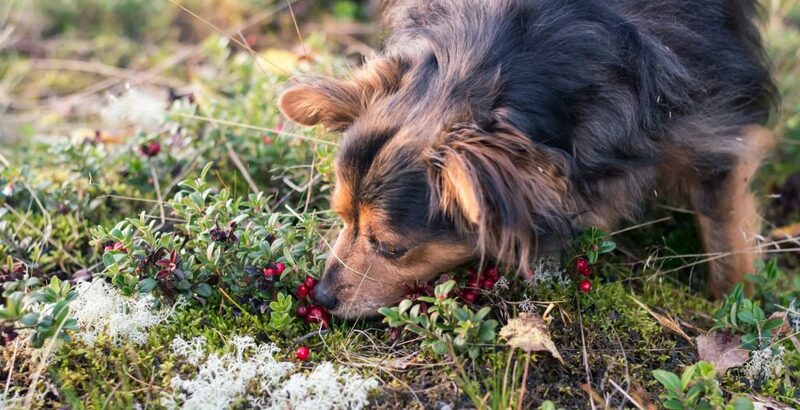 It is a growing sport that is based on your dog’s natural instinct to hunt and sniff out prey. This fun activity will benefit your dog by building its confidence and exercise its mind and body. You will enjoy watching your dog work and it will deepen the bond between you, even if you do not do it competitively. K9 Nose Work was founded and developed by Ron Gaunt, Amy Herot, and Jill Marie O’Brien, all certified experts and highly accomplished in training K9 detection and tracking dogs for law enforcement. Using their extensive experience in professional canine detection, these three K9 experts developed K9 Nose Work to give people and their pet dogs a fun and easy way to learn and apply scent detection skills. How Do You Get Started in Nose Work? K9 Nose Work is fun for any dog and the owner who wants to try it. Neither of you need any obedience or other training. This sport is a game that builds on your dog’s natural abilities. It is so easy to learn because your dog will love playing games that use its scenting instincts to find its favorite treat or toy. Get started in this fun activity by locating a K9 Nose Work class or workshop taught by a certified Nose Work instructor. Find the right trainer for you, your dog, and your goals. In Nose Work classes specifically, you should start by taking the Intro class to learn the foundational skills. The subsequent Nose Work class will introduce odor targeting. When you begin Nose Work training, your dog will start the game by simply finding a treat or toy on its own, with no owner interruption. The dog will continue training that way for three months to one year, depending on the dog’s own pace of learning. During that period, the dog will develop confidence in its ability to achieve success in hunting and scenting. It also builds the dog’s mental and physical fitness, which is vital for your dog’s good health. All the while your dog is learning new hunting skills in different environments, unimpeded by the owner. As the dog progresses in its abilities, the search games become progressively more difficult. They will include odor targeting, introducing multiple containers in the search and the concepts of exterior, interior, and vehicle searches, all of which are part of Nose Work competition events. If you are interested in Nose Work as a competitive sport, you should take regular classes to make sure you both have the skills needed to be competitive at that level. Once you and your dog become sufficiently advanced, you can participate in mock competitions to test both of your skills. Some owners use an experienced handler to handle their dogs in competition. You can get a lot of detailed information about the competitions time and location from the National Association of Canine Scent Work (NACSW™), the official sanctioning and organizing body for the sport of K9 Nose Work. You should go observe them to see what is involved. These competitions are quite demanding. Observing a few of them will help you understand the etiquette and prepare for the challenges you and your dog will face. Before you are eligible to compete in a NACSW™ competition, your dog must be able to identify the location of the target odor and the handler able to correctly call an ‘alert’ within a three-minute time period. This is called an Odor Recognition Test (ORT). To enter an ORT you must be a member of the NACSW™, and your dog must be registered with the NACSW™. At an ORT at the first level of competition, you and your dog will have to search 12 identical boxes with one of the boxes containing birch odor. You must be able to correctly identify when your dog has found the odor box. After passing an ORT, you and your dog are eligible to compete at the Nose Work 1 (NW1) level. Please note that an NW1 trial is much more complex than an ORT. At an NW1 trial, your dog must cope with distractions, environmental stressors, larger search areas, and the four elements of competition (container, interior, exterior, and vehicle). Also, your dog should be prepared to go from crate to work several times during the course of the competition. The next level up is NW2. At that level, you and your dog should expect to find multiple hides in one environment, work through more challenging, less accessible “hides”, overcome food and toy distractions and alert only to odor, and manage a longer, larger search. The highest level is NW3. This is a professional level of nose work. You and your dog will have to demonstrate that the dog can find an unknown number of hides in a search environment, you or the handler will recognize the search behavior in a dog when no odor is present (if there is a blank room), the dog and handler team can work through even more challenging, less accessible hides with varying heights and containment, the dog can overcome food and toy distractions in any environment and alert only to odor, the dog can manage much longer, larger searches, with the interior searches potentially being 12-15 minutes. Whether you decide to compete with your dog or not, Nose Work training will enhance the relationship you have with your dog and your dog will become a more confident and happy inquisitive canine. Tagged: Dog nose work, dog training, k9 nose work, nose work, pet training, trainingLeave a Comment on K9 Nose Work: One Sport Your Dog May Want to Sniff Out! Everyone knows you walk with your feet (or paws, depending on your species), but did you know that the secret to successful loose leash dog walking begins with a mutual connection that comes from the head and the heart? With any DIY dog training, you have to start with an understanding of inquisitive canine behavior. Put your pup on a leash, and s/he’s not going to stop doing what s/he’s wired to do: sniff, explore and investigate. The pull to examine everything that catches your dog’s eye is powerful… literally. This is why so often we see dogs walking their owners, and not the other way around. As a certified dog trainer, I appreciate when inquisitive canines trust their humans enough to be able to look longingly into their eyes. I also love to see dogs and pet parents trotting along, side-by-side, enjoying a leisurely walk. These two activities are not mutually exclusive; in fact, building trust through a loving gaze is the first step to training your dog to walk on a leash. Have your treats and clicker ready. (To brush up on the magic of clickers and how to establish a Click-Treat [C/T] pattern, click here). Your dog may be sitting, standing or lying down, with as few distractions around as possible. Begin to C/T the moment your dog makes any eye contact with you at all. If your dog doesn’t catch on right away, make kissy noises to prompt him or her or show a treat and then hold it up next to your eyes. As soon as your dog glances up, go ahead and C/T. Shape their behavior by C/T — go from the baby steps of glancing near your face to looking into your eyes. Gradually increase the time your dog looks at you before you C/T. Remember: Once your dog makes eye contact with you, complete each step at least ten (10) times before making it more difficult, such as adding in distractions or asking for a longer time of eye contact. It will be up to you if you want to use the cue word “Watch” or your dog’s name. If your dog seems bored or distracted, lower the bar of what you want and raise the rate of C/T. You can also try using a different kind of treat. Once you’ve built that trust and your dog is looking to you for more information, you’re ready to move from watching to walking! Taking your dog for a walk should be fun and enjoyable for everyone. Loose leash dog walking means your dog is on leash and calmly proceeding near you, within the length of the leash without pulling, tugging or lunging. As we all know, this can be challenging for many dogs, especially where there are lots of new places to go, people to meet and other dogs to sniff. It can be challenging for us if we have a dog that enjoys pulling (either to get somewhere or to prevent from leaving a specific location). With time, patience and consistency, dogs can learn how to walk nicely on leash, making it more pleasant for both of you. Begin by holding the leash with one hand at your belly button – like an ice cream cone – with your arms relaxed. This allows you to use your center of gravity as an anchor to help from being pulled over and to help prevent from pulling back on the leash accidentally. Next, prompt your dog to come to your side. Use a food lure, a happy voice, a verbal and/or visual cue. Say yes, then give a treat. Keep in mind that the leash is used as a safety line, not for controlling your dog. Try not to pull or tug at your dog. Also, it’s best not to wrap the leash around your hand or wrist (prevents injury if your dog does pull). Be sure you’re using appropriate and safe walking equipment, including a front-clip harness. You may want to do the first few runs indoors, where there are not as many distractions as outside. Give a verbal walking cue, take two or three steps (using a food lure if necessary), stop, have your dog stop (or sit, which is optional), say yes and treat. Continue to practice this step until your dog is offering on his or her own. Then begin to take additional steps, increasing the distance. Add in the “Watch Me” phrase when you stop and also say it intermittently when walking. This teaches your dog to check in with you on a walk and helps remind him or her that you’re out together. This enhances the bond you share. Once your dog understands the concept of loose leash dog walking, increase the pace by walking briskly indoors with him or her on leash If s/he goes to the end of the leash, change direction and keep walking at a quick pace. When s/he comes near you on the side you want her or him to walk, use a cheerful voice to praise. Whenever s/he gets into heel position or puts slack in the leash, say yes and treat. Also, reward for any eye contact. If after a couple minutes you don’t find your dog spending more time at your side or with a slack leash, consider moving to a less distracting area. You may also reward more frequently, delivering the treat in the position you want. The point in doing this is to help motivate your dog to stay interested, as opposed to wandering to the end of the leash, looking for something else to do. Once you’re comfortable with loose leash dog walking and eye contact, make it more challenging by adding in one distraction at a time. Before you know it, you’ll be watching your dog walking outside on a loose leash – and best of all, you trained him or her yourself! Yellow Vest: Service Dog or Canine Fashion Statement? No matter your politics, I think you’ll join me in saluting the United States Department of Justice for its clarification on service animals – FAQs on Service Animals. As a certified professional dog trainer and behavior consultant, I see SO much inconsistent information on the subject. “I have heard stories from well-intentioned dog lovers — and even witnessed — what I would consider law-stretching and boundary-crossing. Some of these actions risk endangering the public, and putting dogs at risk too. Plus, they could create situations where laws would be changed that negatively impacted those that really need services dogs.” We encourage you to read through all of the FAQs on Service Animals. 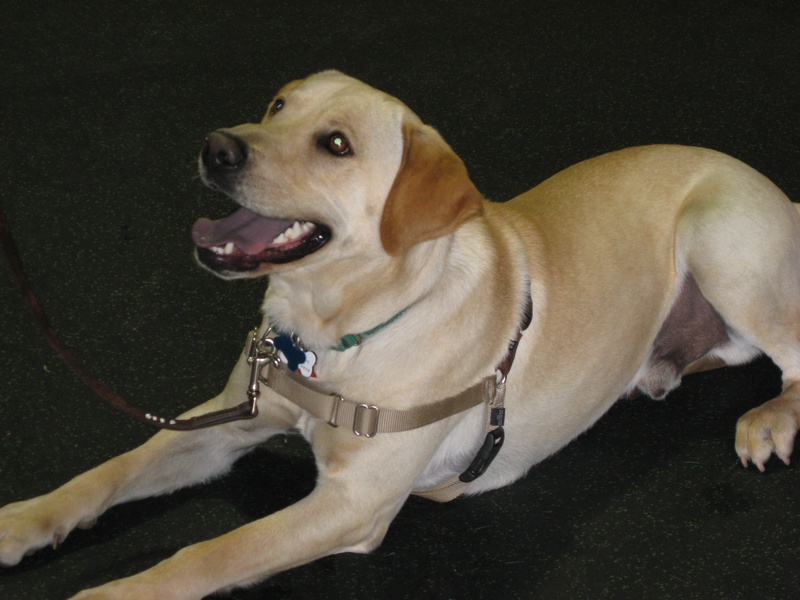 This guide dog is considered a service animal because it is trained to do work or perform tasks for the benefit of an individual with a disability. You’ll find surprising information, too. Check out Question #17. “Does the ADA require that service animals be certified as service animals?” The answer is: “No.” Well shoot, I got this one wrong! 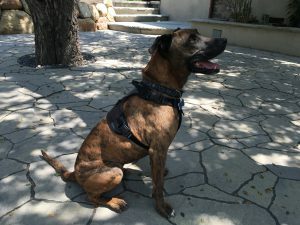 “Covered entities may not require documentation, such as proof that the animal has been certified, trained, or licensed as a service animal, as a condition for entry.” And you may be surprised to learn that service animals don’t need to wear a yellow vest or an ID tag, special harness, or any color vest, for that matter. See if you know the answers to these questions. Check your answers here: FAQs on Service Animals. 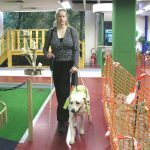 #31 – Are stores required to allow service animals to be placed in a shopping cart? #32 – Are restaurants, bars, and other places that serve food or drink required to allow service animals to be seated on chairs or allow the animal to be fed at the table? #33 – Are gyms, fitness centers, hotels, or municipalities that have swimming pools required to allow a service animal in the pool with its handler? The DOJ clearly spells out the difference between service dogs and therapy dogs. Therapy dogs, sometimes called comfort or companion animals, provide comfort by being with a person and have not been trained to perform a specific job or task. But we think they should be able to pass one of the various 10-step evaluations such as the one provided by Love on a Leash to ensure they have the skills to be comfortable and polite in public. And, by the way, misrepresenting a dog as a service dog is pretty serious business. Don’t do it. 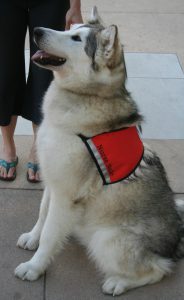 The Love on a Leash nonprofit is a wonderful resource for learning more about therapy dogs. And how your dog can become one. As a certified professional dog trainer and behavior consultant, I am eligible to administer the Love on a Leash. If you would like more information on the process, or would like your inquisitive canine to be tested, we invite you to contact us. Wanna share pics and videos of your inquisitive canine? We invite you to post on our Facebook page. Posted in: Bow-Wow Behavior, Dog Training 101, This & That Leave a Comment on Yellow Vest: Service Dog or Canine Fashion Statement? A Dog Training Pop Quiz: Is Your “Home Alone” Dog Bored or Stressed? Spring is in the air! Soon the dog days of summer will be here. What do the warmer weather and change of seasons mean for your inquisitive canine? Will he or she be spending more time alone? Will they have to entertain themselves? If there’s a sudden shift in your routine and your dog isn’t used to solitude, and doesn’t like it, there may be some behavioral issues coming down the pike. 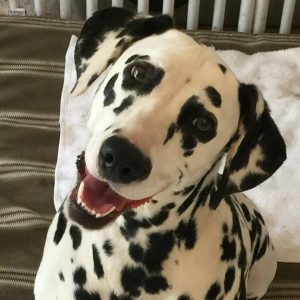 Poncho and I developed this Home Alone quiz to help determine if your dog might be bored, be on the brink of isolation distress (or separation anxiety), or just hunky dory with some new found solitude. Lies on his or her bed, watching you get ready, relaxed. Begins pacing around back and forth, clinging to you. Some dogs enjoy catching up on naps or gnawing on chew toys when left alone during the day. Whimpers, whines, and scratches at the door to go with you. Didn’t appear to care one way or another. He or she was happy when you got home, and nothing out of the ordinary when they greeted you. Eliminated on the rug, chewed up the door and window frame, vocalized to your neighbors, and even left the tasty treats you offered up. Eliminated on the rug, chewed up the door and window frame, and left the bowl of food alone, chewed up paws, and according to your neighbors barked and howled all day. Is excited to see you, as if running to say “Welcome home!” However, you notice that not only is the food in the bowl gone, but your dog went counter-surfing and dumpster diving in your kitchen, redecorated the living room by chewing up the couch and pillows, helped with laundry by dragging it all over the house and chewing up your new socks, and topped it off by re-landscaping the yard by digging up the flowers you just planted. If you’ve answered mostly 1 for each question, then bravo to you! You’ve done a great job at teaching your dog to be independent and comfortable on his or her own! If you’ve answered mostly 2 for each question then we recommend you consult with a certified professional dog trainer who specializes in separation anxiety conditions or vet behaviorist to discuss signs and symptoms related to canine isolation distress. There are medications and behavior modification plans that can be implemented to help with these issues. If you’ve answered 3 to the last question, then consider your dog might be bored – scenarios such as this means your inquisitive canine is designing his or her own scavenger hunt! Providing enrichment is key to help prevent boredom-related issues. Being passionate about this topic ourselves, we’ve blogged about it a lot! 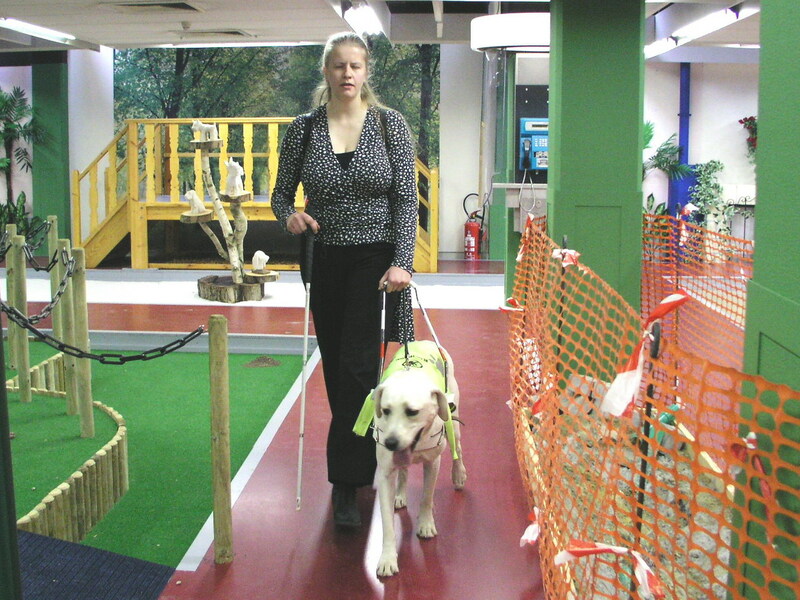 So click here to find out more about enrichment for dogs. Keep in mind that our canine companions are social animals. They enjoy the company of others and often do not do well when left alone – unless you condition them to do so. Taking the time to teach them independence and coping skills are key to raising a healthy and happy dog! Posted in: Bow-Wow Behavior, Dog Training 101, Fido Fundamentals, This & That, Your New Dog Leave a Comment on A Dog Training Pop Quiz: Is Your “Home Alone” Dog Bored or Stressed? 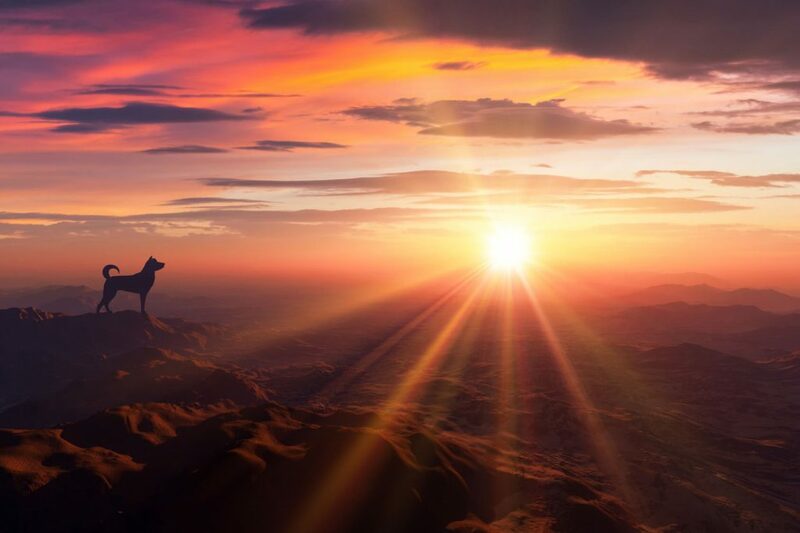 What’s your Inquisitive Canine’s favorite thing to do? Sniff? Explore? Agility? Maybe yours is more of the eat, pray, love type. My sidekick Poncho enjoys a lot of different activities, and he’s very good about any work-related task I request of him. I’m bringing this up because of one of my favorite videos. Just Jesse the Jack stars Jesse, a Jack Russell Terrier, and Heather, his genius handler. Heather honed in on Jesse’s natural abilities and taught him amazing things by capitalizing on behaviors she liked and putting them to good use. I know you’ll enjoy and appreciate Jesse. While watching the video, zero in on how Heather adapted his innate canine skills to our human environmental needs. Retrieving – brings the television remote. Targeting – uses nose and paws to close doors and cabinets. Jumping – grabs things for Heather. Digging – uses paws to massage Heather’s back and to clean the sliding glass door. Tugging – helps Heather get dressed and tucks himself into bed. Oftentimes, the always exuberant Jack Russell Terrier isn’t taught to direct his abilities in appropriate ways. The excellent digging skill results in a torn up lawn or tugging turns a couch into a shredded mess. Behaviors need to be put to use in ways that are fun for your dog and for you. So, Inquisitive Pet Parent, what can your dog do? Any behaviors that can be redirected? Leave a comment because we’re inquisitive, too! We’d love to make some new friends. 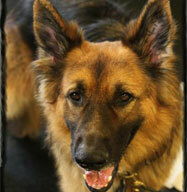 Post snapshots and videos of your favorite Inquisitive Canine on our Facebook page.